Exclusive Books has made gifting easy for South Africans this year, with more than 100 titles to pick from in its annual festive catalogue – including Becoming, Michelle Obama’s personal account of her upbringing, her life in the White House and what it’s like to raise two daughters under the media’s glare. The catalogue is available free from Exclusive Books stores from 1 November. Alongside Becoming, other such blockbusters will include Yuval Noah Harari’s 21 Lessons for the 21st Century and Out of the Maze: A Story About the Power of Belief, the final book by Dr. Spencer Johnson, of Who Moved My Cheese? fame. DJ Sbu’s The Art of Hustling: Sell or Surrender headlines the business category with Johnson. “It’s the book that will launch a thousand SA entrepreneurs,” said Williams. For cookery enthusiasts, Jamie Oliver’s Jamie Cooks Italy will transport home chefs to the Bel Paese, while Simply Zola by Zola Nene serves up a South African taste sensation. John Grisham’s The Reckoning stands tall in the fiction section, along with George RR Martin’s Fire and Blood and Deon Meyer’s Prooi. “Take them all to the beach!” said Williams. For younger readers, the Harry Potter Pop-Up Guide to Hogwarts is set to provide hours of fun, and the Diary of a Wimpy Kid box set – all twelve books in one place, at a special price – is a sure-fire future heirloom for every reading family. On the sports scene, Shane Warne’s autobiography, No Spin, has already set tongues wagging – with sledging to follow, no doubt. Fanatics members will earn double points on all the books featured in the catalogue. 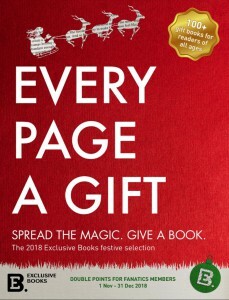 Spread the magic – give a book this season, with Exclusive Books. The coupon is valid for R25 off a single purchase of R100 or more in any Exclusive Books store (except Botswana and EB Online) for the period 1 November – 31 December 2018. Only original coupons will be accepted, no photocopies. This coupon can only be redeemed against the purchase of goods and not exchanged for gift cards or vouchers.